If you've been listening to public radio during the Olympics, you may have noticed a lot of stories about curling. PRI's "The World" has offered "A Canadian Curling Legend Is Going for Gold as Coach of China's Curling Team" and "Norway's Curling Team Brings Its Fancy Pants Back for Sochi." NPR's "Morning Edition" has aired "7 facts and 4 GIFs: Hellooooo Curling" and "High School Students Are Invited to Try Curling." So why, you may ask, do public radio reporters and editors love curling? In part, I think it's because curling seems more approachable than some of the other Olympic events. Although many of the longtime members of the San Francisco Bay Area Curling Club I spoke with are from Canada or states along the U.S.-Canada border, and thus grew up with some exposure to the sport, even Olympic-level curlers don't need to have started training when they were toddlers, the way that top figure skaters or snowboarders do. There's no such thing as a professional curler in the United States — the Olympic squads will return from Sochi to their regular jobs, such as teaching school, working in doctors' offices and managing restaurants. In part, I think we're influenced by social media. My Twitter stream has been full of comments from people who have stayed up until the wee hours of the morning to watch the live stream of a curling match between Switzerland and Russia. KQED Sacramento Bureau Chief Scott Detrow even found a match playing on one of the TVs at the California Emergency Management Agency. But also — and I did not realize this until I went to record a clinic for beginners — curling is quite possibly the most radiophonic of the winter sports. It combines the interesting percussive sounds of sweeping with the haunting rumble of stones gliding over the ice. And then there's the yelling. 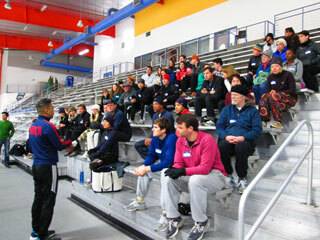 Brian Davidson, one of the curling club's senior members, informed the novices in attendance: " 'Sweep! Go! Hurry hard! Hard!' All of those mean 'sweep.' Usually, as a team, you decide on what the commands are." Another club member, Ryan Alvarado, had heard a very polite variation. "One of my skips said, 'Yes, yes.' And one said, 'Yes, please. Yes, please. Yes, please.' So you knew it was him." Being able to pick out the voice of your skip, or team leader, from a confusing hubbub of other voices yelling at different teams is part of the art of curling. The skip is down at one end of the sheet of ice, and the rest of the team is at the other end -- one throwing the stone and two others sweeping the ice in its immediate path, hoping to affect its speed and trajectory. "I'm pretty good at yelling and being loud," San Jose native Sergio Soria told me. He'd been meaning to come to a learn-to-curl clinic over the last several Olympiads, and finally got around to it this year. Kevin Baptista made the trek in to the Oakland Ice Center from the Central Valley. "My wife got me, for Christmas, a present to come here with my buddy and go curling," he said. "Because I've been watching it on TV for years, and I just really love it." Nancy Carruth of San Francisco likes the Olympics, too, but she and her husband were motivated by a challenge thrown down by her Canadian relatives. "They called us and said, 'We signed you up for a mixed doubles bonspiel (curling tournament) in April,' " she said. "So we figured we'd better come try it first, before we have to go compete!" Longtime club member Jay Diamond of Menlo Park said the homey simplicity of the curling gear can be deceptive. "Everyone sees the brooms and they think it's light housekeeping," he said. "But it's actually interval cardio. It's a really good workout. Two hours of heavy sweeping is as good as any day I spend in the gym." But you don't have to be a gym rat, his fellow club member Kate Garfinkel said. "Anyone can do it. We have people of all ages and body types. On Friday nights we have two middle-schoolers curling with us." Brian Davidson put it this way: "It's a real easy sport to get started, and be decent. It's a real hard sport to get good at." However, if you just want to stay at the decent level, club member Jesus Barajas said, that's fine. As long as you're having fun, your fellow curlers will not judge. "You spend two hours on the ice, and it's sort of a chess match, a lot of strategy," he said. "Then afterwards you follow the First Rule of Curling: Take your beverage and talk through with your teammates how the game went. And then you can talk about the rest of life, too." Indeed, no curling clinic, or story about curling, is complete without that famous First Rule of Curling: "Winner buys beverages." If previous groups of Olympic-season curling fans are any judge, about 20 percent of those who show up at a learn-to-curl event will come back for more lessons, and half of those will stay with the club for the long haul. Brian Davidson said the growth has been steady enough to allow the San Francisco Bay Area Curling Club to secure its own dedicated ice facility, which will open later this year. Right now, like most American clubs outside the traditional curling heartlands of the Upper Midwest and Northeast, the local curlers buy time at ice arenas, competing with hockey teams and skaters. "Dedicated ice for league curlers is the Nirvana to which one aspires," said Davidson. "It's the right kind of ice, so it curls very nicely. You're able to leave your stones on the ice, you have locker rooms, you have your own bar." Yes, their own bar. Where the First Rule will be applied strictly, no doubt. The dedicated facility may help aspiring Bay Area Olympic curlers. Davidson said one member, who started at a learn-to-curl clinic several years ago, has made it to Olympic trials. But in order to find practice time, she had to fly up to Seattle. 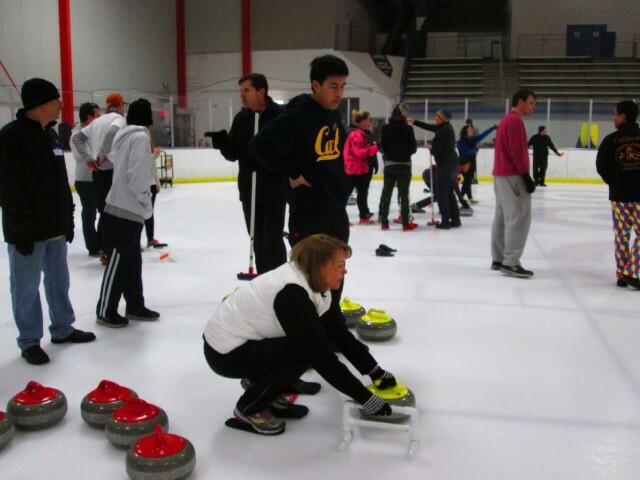 The club is offering learn-to-curl clinics in Oakland and San Jose through the middle of March.